Not the most exciting project, but one of those that makes the house feel a little more finished. See, when we did the electrical work we wired for two ceiling fans, one in each bathroom. 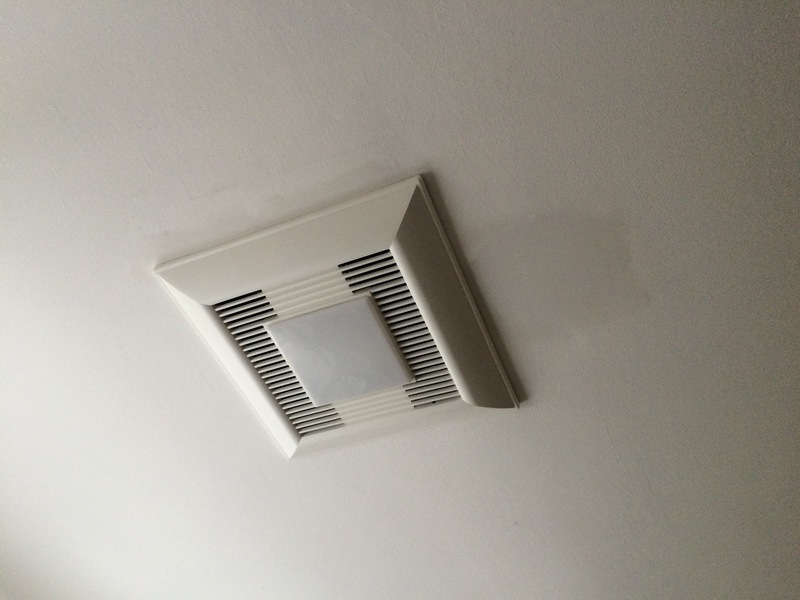 My father and I put the one in the upstairs bathroom in place, and the downstairs one came about months later with the help of a handyman, who also vented the upstairs fan with me. 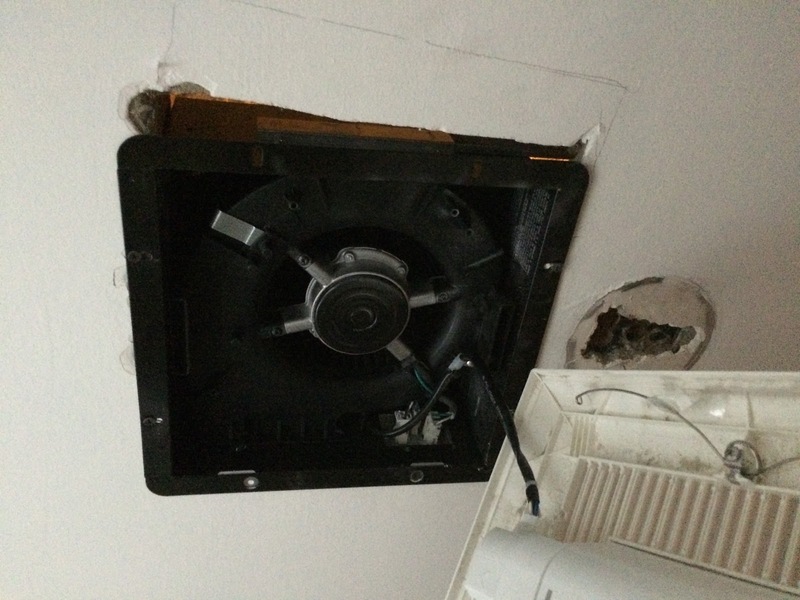 When we put the upstairs fan into place, we didn’t realize that it came apart into as many pieces as it actually did. 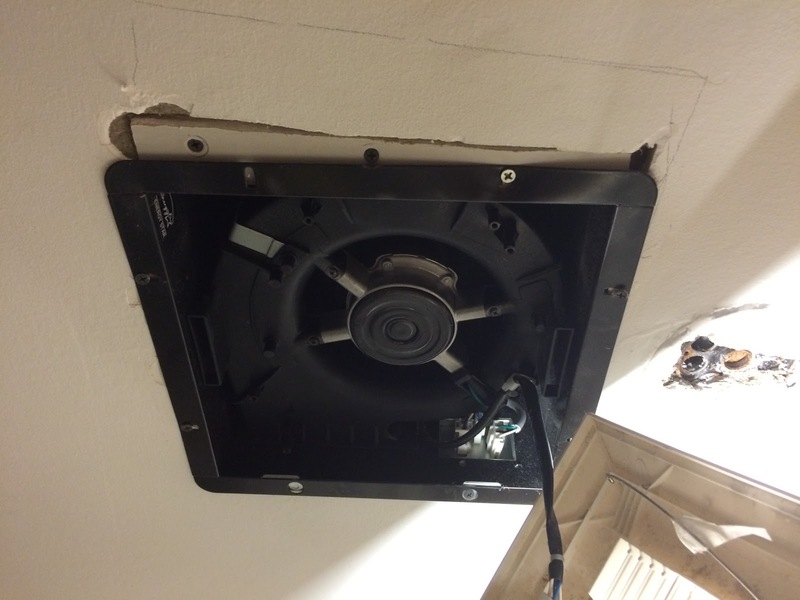 So we cut the hole bigger than was strictly necessary for the fan to fit in. 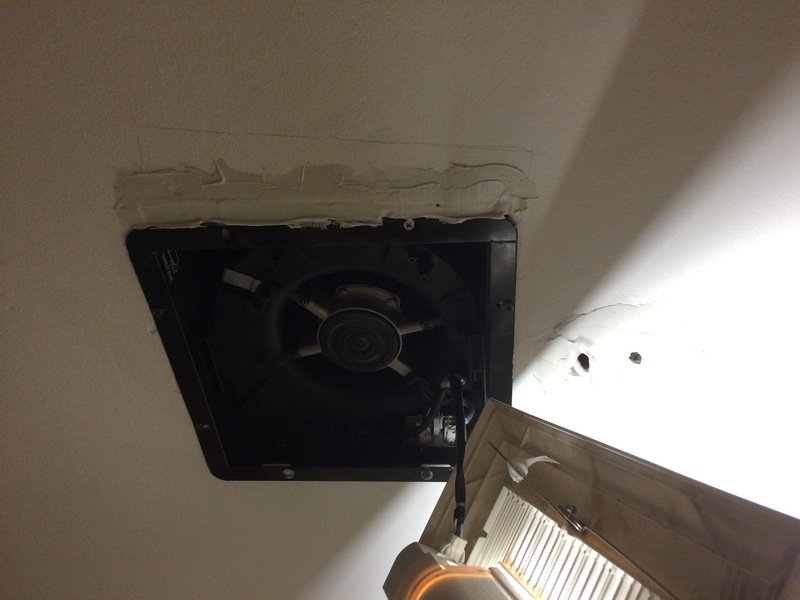 Result: a gap around the fan. 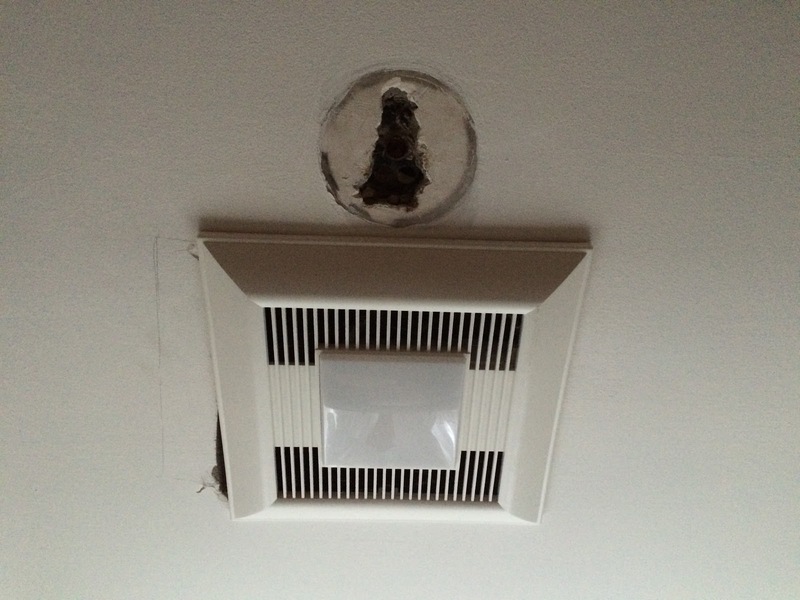 There was also a hole from the old light fixture. For about 14 months, then, the upstairs bathroom ceiling looked like this. The fix was a two part piece of work. 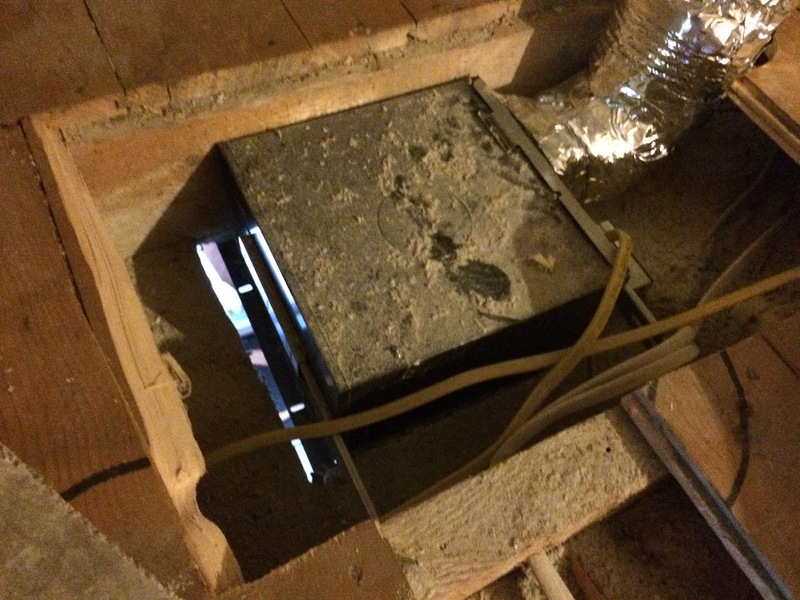 The straight-up hole had to be braced with another piece of sheetrock and then mudded over, and the hole where the light fixture was had to be just mudded over. So part one: patching the sheetrock. That required going up into the attic and working from above. 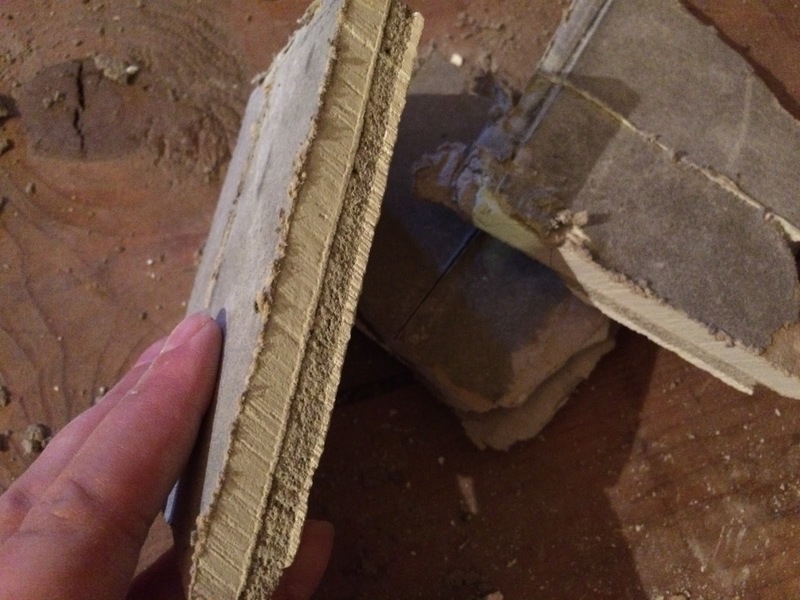 I had actually saved part of the sheetrock that we cut out, because the sheetrock used throughout the house is not normal. It’s an older form of the stuff, that has a basic concrete core (yes, really) and in this case it also had a thick layer of plaster over it. So it was both thicker and sturdier than modern sheetrock. 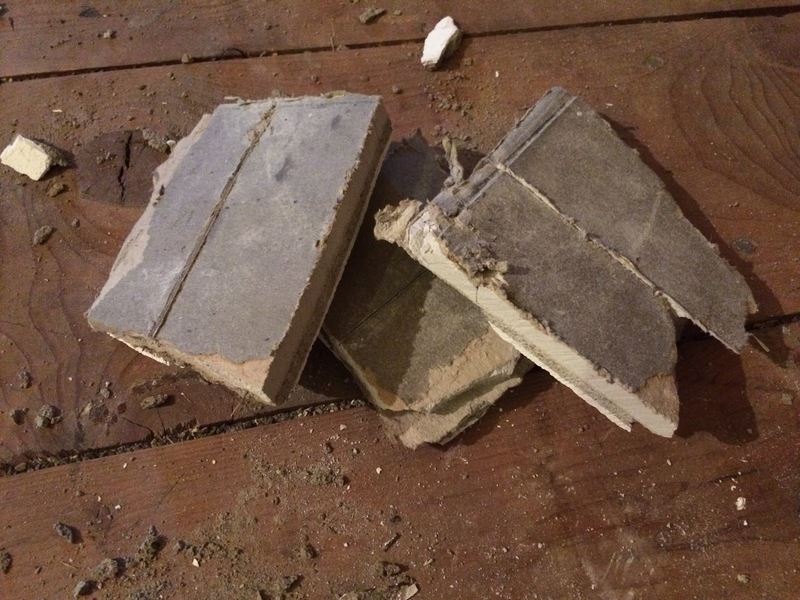 Unfortunately, that meant that it did not cut or break like the sheetrock I was used to, so after several attempts to get a piece that would fit into the gap, I was left with just a pile of broken sheetrock. On to Plan B: using some of the endless scraps I have in the basement left over from the wall project. That went much more quickly, and after quite a bit of trimming I got a piece that dropped into the gap easily enough. Then, I found a scrap piece of 2×4, also left over from building the wall, and because I didn’t want to actually trim the thing and it was so close to fitting, I hammered it into place. 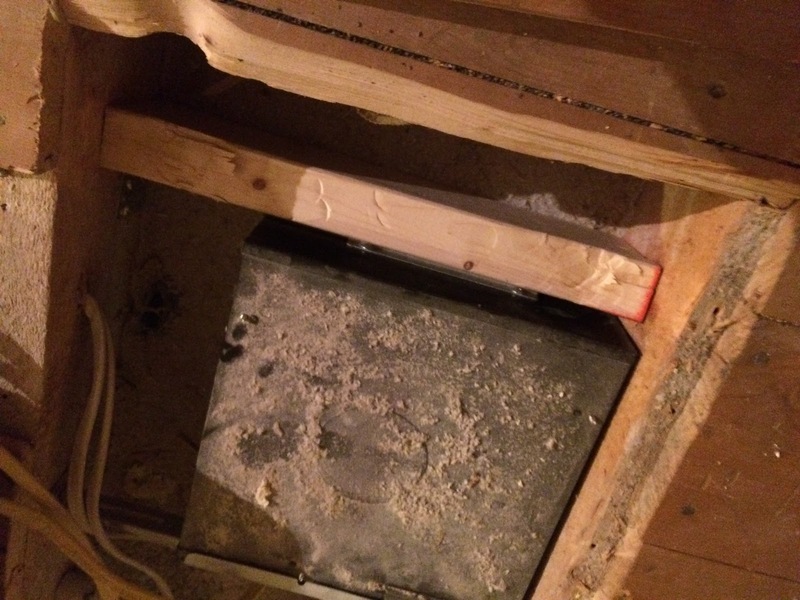 It wasn’t going anywhere short of an earthquake, but I put a couple of screws diagonally and down into the floor beams anyway. 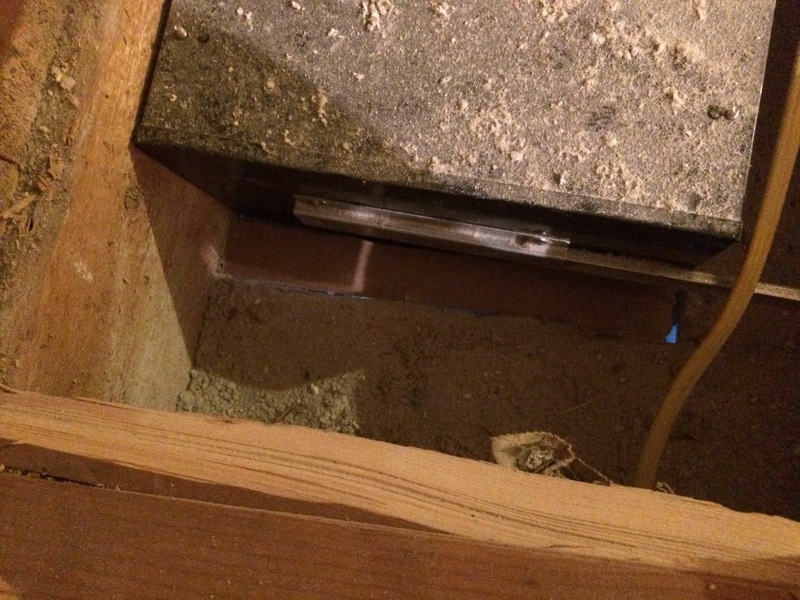 Next step, going back underneath and screwing up from the new piece of sheetrock into the new wood brace. 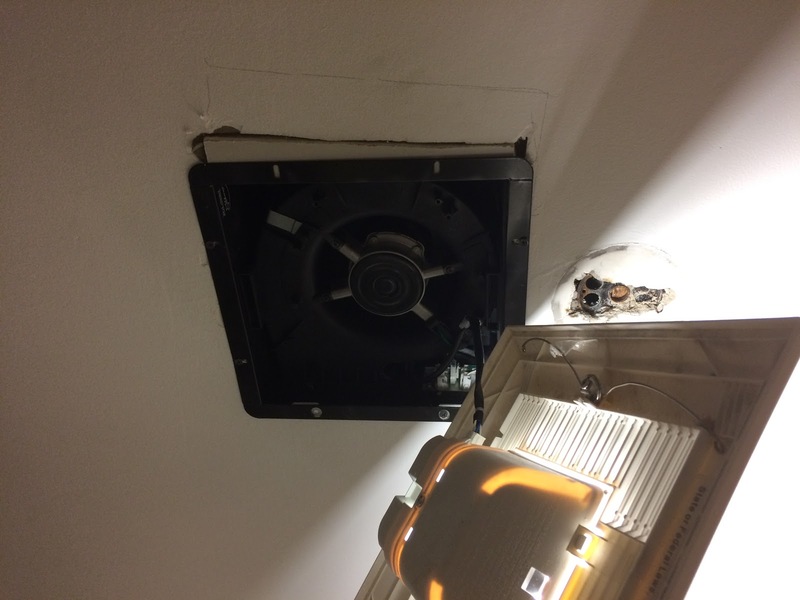 I put one of the screws through the fan itself, though it was already quite secure, just to be extra careful – it was easy enough to just move a screw half an inch to the right and get some extra solidity. Then: bring on the mud! Two layers for the patched area, and three for the hole leftover from the old light fixture, with sanding in between. This was mostly a matter of hurry up and wait. 24 hours to dry a coat, 5 minutes to sand it down, another 5 minutes to apply more plaster. I could’ve done it in three days but there were a few evenings I opted out on account of laziness. So this past Friday night I did the last sanding and put the light back in place and voila! The real last step is to repaint the bathroom ceiling but that’s not happening. I might use some of the paint from the downstairs bathroom ceiling to patch these pieces really quickly, but it won’t match exactly. Until we redo the entire bathroom, I’m not going to repaint the entire ceiling.